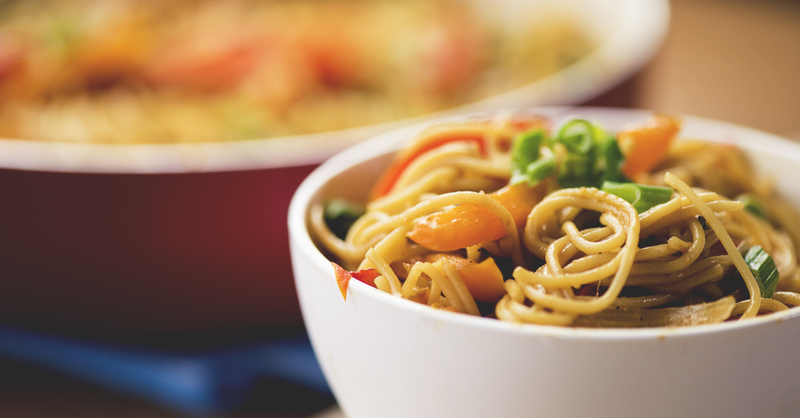 This Asian Inspired Noodle Dish Is A Lot Easier To Make Than You Think! When we’re running low on time (which is often! ), this dish is one of our go-to staples. In under 30 minutes we can get delicious, veggie-filled noodles on the table and in our bellies. This fragrant dish is light, while still filling us up, and we love the pops of colors from the bright bell peppers and green peas! And while these noodles are great, the sauce they’re swimming in steals the show – soy sauce, garlic, ginger, and a touch of chili paste give this dish a deep flavor that tastes like it took way longer to make than 20 minutes! We use angel hair pasta (which we always have on hand), but feel free to use rice noodles if you prefer. Either way, give this recipe a try the next time you want a quick, easy meal – we bet you’ll love it! In a small bowl, combine chicken broth, soy sauce, minced garlic, hot chili oil, and ginger, and set aside. In a large skillet, heat vegetable oil over medium-high heat. Add peppers, shallots, and curry powder, and saute until softened, about 3-5 minutes, then add mushrooms and peas, and cook an additional 2-3 minutes. Add cooked noodles to the pan and toss to combine. Pour in about 2-3 tablespoons of the sauce, and fry for an additional 2-3 minutes, tossing continuously so that noodles do not stick together.